This week you guys! It’s been….not all that awesome. I have Thursday and Friday off, but the first three days of work this week were unusually awful. A lot of annoying things to deal with. Also my bathroom seems to be infested by little baby white spiders that I have to kill every hour or so as more show up. Also have I mentioned the boyfriend is out of town????? What is this????????? You have know idea how excited I was to find this at Wegmans! 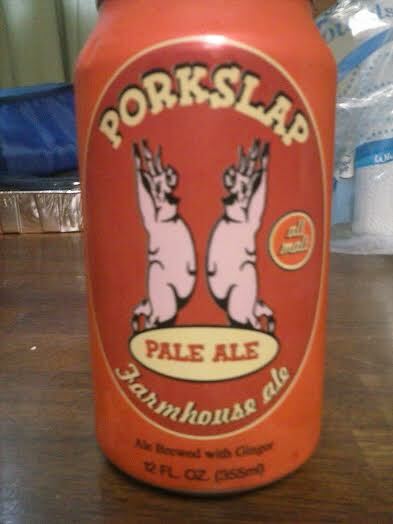 I’ve had Porkslap before and really love it. It’s a farmhouse ale, as you can see from the photo of the can (side note-I’ve been buying all canned beers lately?? Which is weird because I normally prefer bottles over cans..). Every year the boyfriend and I go up to Lake Placid to do some hiking, and per tradition, we always stop at this wing place. Now normally the rule is that whenever you are outside of Buffalo, you DO NOT GET WINGS. Because they don’t taste good anywhere else. But we had been hiking up mountains all day the first time we stumbled upon this place, and the wings are surprisingly great! Also, they have Porkslap on tap and we always get it to go with our wings. So there you have it. My beer. And I’m off the rest of the week so yay! This entry was posted in Uncategorized and tagged beer, buffalo, chicken wings, craft beer, farmhouse ale, Lake Placid, pale ale, weekend. Bookmark the permalink.